2. When you should lie low - During your Opposite sign - it's exactly six months from your birthday! For Scorpio, that would be when the Sun is in Taurus! 3. Follow the Sun. Every month, the Sun glides through each of the Twelve Houses. Want to know yours? The Sun begins your year in Capricorn, your 3rd House, then enters Aquarius, your 4th and so on. 4. Maximize your best days of the month by following the Moon. You typically get 2.5 days of the Moon in your sign every month. There is a Moon Calendar on Daily Forecasts that keeps you updated. 5. Where you might feel restriction, lightening strikes or blocked or maybe need a lifeline? Saturn in Capricorn occupies your 3rd House of neighborhoods, siblings, the Internet, neighbors, how you express yourself and short distance travel. 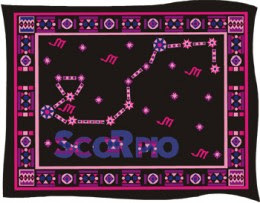 These areas need attention as they slowly but surely transform in front of your eyes, Scorpio. Saturn was in your sign a few years back and you should be filled with knowledge on all of these topics. There is a lesson to be learned here and once you master that lesson, you are free to move on to the next, please! It would be very helpful to have a Capricorn friend, relative or companion during this time. Just know that you are being tested with this placement and as long as you learn from mistakes, you should have nothing to stress about, Scorpio! Your 5th House of fun, hobbies, love, relationships, pets, gambling, speculation and taking risks. You are not seeing the entire picture when it comes to these areas. Sometimes, a second set of eyes helps, so when it comes to all things 5th House, you must make certain that you have a clear cut understanding of these areas and how you plus others are working with you or not with you. Your 3rd House of self-expression, communications, the internet, siblings, neighborhoods and or neighbors and short distance travel. You might need to tear down in order to rebuild on a more solid and secure base for the results will astound you and those who had no faith in you. Score! 10. When you can make a fresh start.........The New Moon in Scorpio (11/7/18) and whenever the Sun transits your sign, Scorpio. Happy Birthday! 12. The signs of Aries, Leo and a Sagittarius play important and instrumental roles in your life this year, 2018!